Young man sitting in square and holding his smartphone. Male in his 20s using mobile phone. 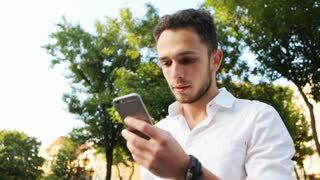 Handsome stylish male in his 20s texting outdoors by using smartphone.
. Handsome male in his 20s using laptop inside an empty cafe. Blogger typing a text. 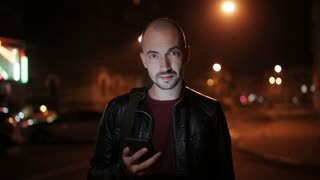 Man sms texting using app on smart phone at night in city. Handsome young business man using smartphone smiling happy wearing suit jacket outdoors. Urban male professional in his 20s.